Reading and share top 7 famous quotes and sayings about Evergreens by famous authors and people. 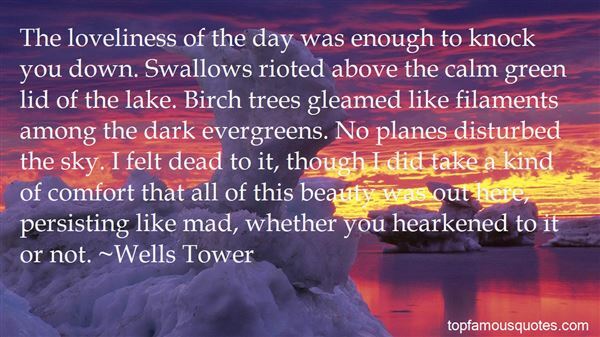 Browse top 7 famous quotes and sayings about Evergreens by most favorite authors. 1. "Clear water sped over rocky clusters whose colors ran from ivories to mossy greens, blues and grays. Though clouds covered the sun, the sway of dappling evergreens gave the water sparkle." 2. "Evergreens are prudish. Evergreens over the holidays are a tease." 3. "I rejoice that there are owls. Let them do the idiotic and maniacal hooting for men. It is a sound admirably suited to swamps and twilight woods which no day illustrates, suggesting a vast and undeveloped nature which men have not recognized. They represent the stark twilight and unsatisfied thoughts which all have. All day the sun has shown on the surface of some savage swamp, where the double spruce stands hung with usnea lichens, and small hawks circulate above, and the chickadee lisps amid the evergreens, and the partridge and rabbit skulk beneath; and now a more dismal and fitting day dawns, and a different race of creatures awakes to express the meaning of Nature there." 4. 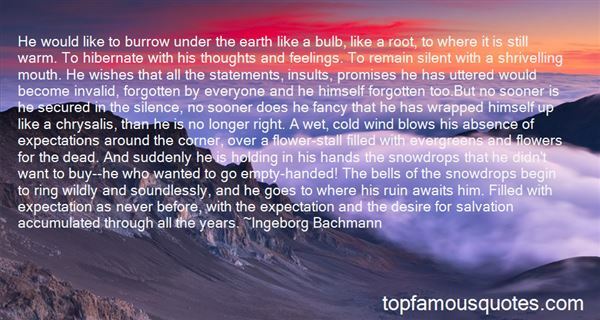 "He would like to burrow under the earth like a bulb, like a root, to where it is still warm. To hibernate with his thoughts and feelings. To remain silent with a shrivelling mouth. He wishes that all the statements, insults, promises he has uttered would become invalid, forgotten by everyone and he himself forgotten too.But no sooner is he secured in the silence, no sooner does he fancy that he has wrapped himself up like a chrysalis, than he is no longer right. A wet, cold wind blows his absence of expectations around the corner, over a flower-stall filled with evergreens and flowers for the dead. And suddenly he is holding in his hands the snowdrops that he didn't want to buy--he who wanted to go empty-handed! The bells of the snowdrops begin to ring wildly and soundlessly, and he goes to where his ruin awaits him. Filled with expectation as never before, with the expectation and the desire for salvation accumulated through all the years." 5. "The loveliness of the day was enough to knock you down. Swallows rioted above the calm green lid of the lake. Birch trees gleamed like filaments among the dark evergreens. No planes disturbed the sky. I felt dead to it, though I did take a kind of comfort that all of this beauty was out here, persisting like mad, whether you hearkened to it or not." 6. "The blossoms seem unusually lovely this year. 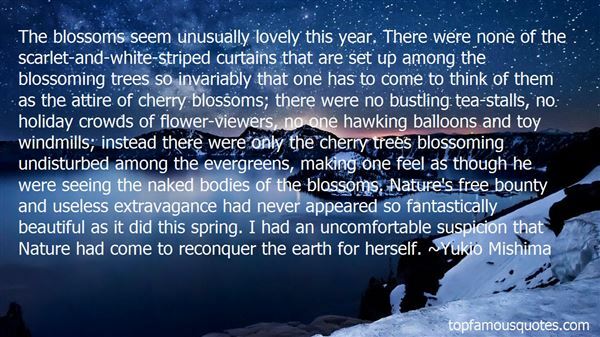 There were none of the scarlet-and-white-striped curtains that are set up among the blossoming trees so invariably that one has to come to think of them as the attire of cherry blossoms; there were no bustling tea-stalls, no holiday crowds of flower-viewers, no one hawking balloons and toy windmills; instead there were only the cherry trees blossoming undisturbed among the evergreens, making one feel as though he were seeing the naked bodies of the blossoms. Nature's free bounty and useless extravagance had never appeared so fantastically beautiful as it did this spring. I had an uncomfortable suspicion that Nature had come to reconquer the earth for herself." 7. "Dante: Evergreens aren't supposed to dieRenee: Everything Dies .."
Understanding begets empathy and compassion even for the meanest beggar - Oromis"